Red Fox is twice listed as one of the leaders of the Oglala Oyuhpe band: first in an 1865 document naming headmen to be contacted by peace intermediaries. The other named Oyuhpes were Standing Bear, Single Crow, and Black Fox (identified as the brother-in-law of trader Joseph Bissonette - he was also the father of Kicking Bear). Possibly these men were wakicunze in 1865? In 1867 Indian Affairs Supt. H. Denman, with the help of trader G. P. Beauvais, prepared a list of Lakota bands and chiefs involved in the hostilities on the Bozeman Trail. For the Oyuhpes he again listed four leaders - Flying Feather [aka White Plume? ], Red Dog, Red Fox, and Shaker. 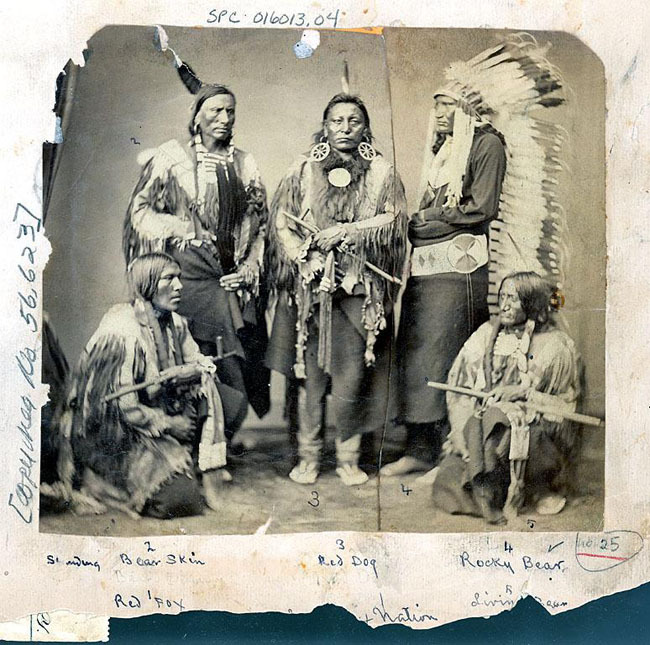 In 1870 we again have in the picture above Red Fox, dressed as a shirt wearer, with Red Dog on the first Oglala delegation to Washington. I can't trace a clear referenced to Red Fox after 1870 - perhaps he died, perhaps he went under another name.